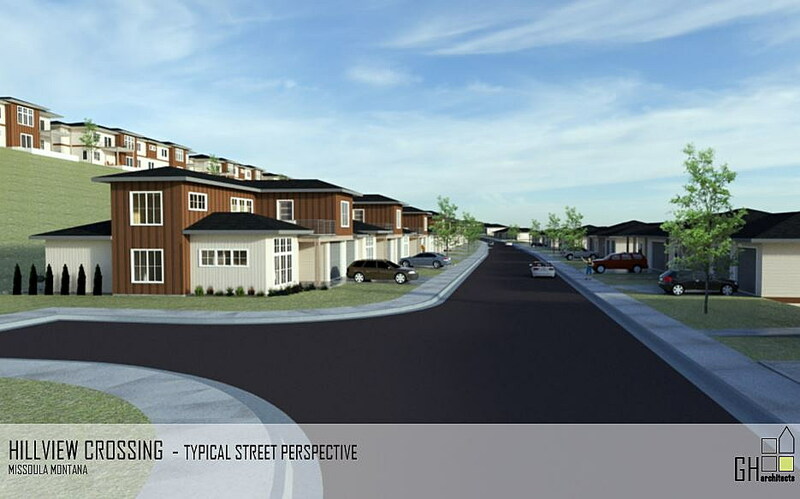 The proposed Hillview Crossing subdivision would include 68 housing units built in 24 townhomes. 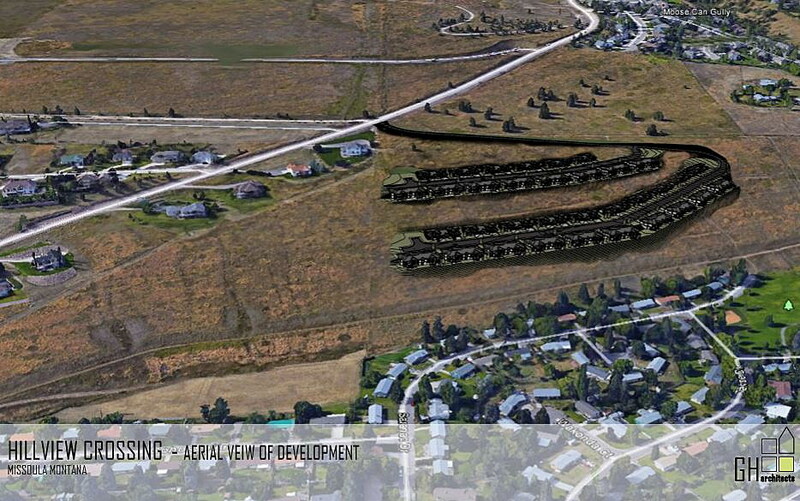 A 68-unit subdivision proposed for Hillview Way received a recommendation for approval by city planning staff on Wednesday, though it will be up to the Missoula City Council on whether it receives the requested permit. Planned for the south side of Missoula, the project – proposed under Montana’s townhome exemption policies – marks the latest iteration of two earlier proposals for the same property, both of which received City Council approval. While neither project went to construction, the latest design marks an improvement over past plans, according to Paul Forsting with Territorial Landworks. Represented by Territorial and proposed by Hillview Crossing LLC, the 25-acre project includes 24 attached townhomes resulting in 68 dwelling units, or roughly 2.9 units per acre. City staff said the number of homes adheres with current zoning and the city’s growth policy, which recommends a density of three to 11 units per acre on the property. In recommending the development for approval, city staff placed 23 conditions on the project, including trail easements, parking restrictions, a pedestrian crossing on Hillview Way, and parkland requirements. It also placed long-term maintenance on the homeowners association, including snow removal. Homeowners would pay into the cost of improvements completed on Hillview Way last summer. But residents in the adjacent Wapikiya neighborhood, which sits on level ground below the proposed hillside development, raised concerns over stormwater runoff, loss of open space behind their homes, and interference with urban wildlife. Jacobs believes the development, even at 2.9 units per acre, is too dense. Other nearby residents stated concerns over past runoff from the hillside, and feared the development could exacerbate the issue if not properly engineered. While members of the City Council offered no comments during Wednesday’s presentation, they posed several questions to city staff ahead of next week’s public hearing. Among them, they asked for a review by Montana Fish, Wildlife and Parks on impacts to wildlife, and whether the project fits with surrounding developments. The project is nearly surrounded by existing homes, making it ideal for what city staff said constitutes urban infill. The project would be fully served by existing city sewer and water. City engineer Troy Monroe said the proposal will require the development to handle the volume of water from short-duration storms without impacting downhill residents. He added that stormwater retention will remain central to the project moving forward if it receives its requested permit. The City Council set a public hearing on the issue for Monday, Dec. 17.